I combined Tuesday Morning Sketch #393 and Color Throwdown #433. The color combo was somewhere between purple and blue to me. I thought it looked more purple, but saw some sample cards done with blue so I was hesitating and finally landed on blue because it gave me the chance to pull out a paper bundle I hadn't used in a long time and had put aside in my pile of stuff I wanted to use again. I found a nice green paper in the Let's Bokeh in the Snow paper pack from Lawn Fawn that went well with my blues. This card came together surprisingly fast. Everything I tried worked right away and the ideas just kept coming. I like that the resulting card could work well for a man - can never have too many of those. On the plus side, "Surprise" is both an English and French word, so this card can work for either case. What a sweet card! Adorable image and wonderful colors! Perfect colors for the challenge! This is such a cute and fun card!! Thanks so much for playing along with us this week at the Color Throwdown! 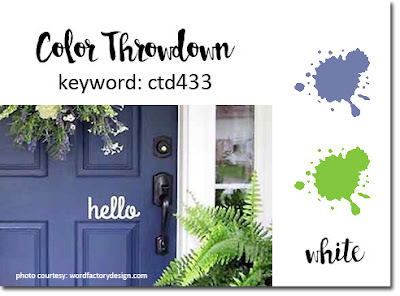 What a fun, sweet take on the throwdown colors! Thanks for joining us in the challenge this week! Great use of thE sketch and colors!! So happy you joined us at CTD! That's an adorable card - love that bear. Thank you for joining us at Tuesday Morning Sketches. This is lol....I was going to say adorable but that's what Melissa said but I'm saying it again anyway because it is absolutely adorable!! 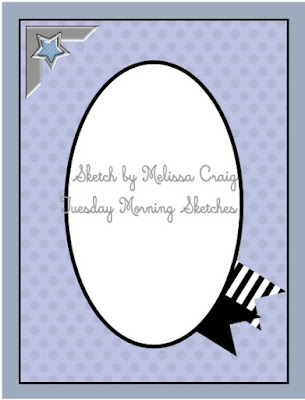 Thanks so much for creating with us at Tuesday Morning Sketches!